The outer part of the upper leaf of this oval-shaped dial has a wind rose with 32 directions, with the inscription 'NORT [fleur-de-lis] WINDT' marking the north, compass viewing hole and brass index arm. At the bottom is inscribed 'HIC M ARINVS COMPAS SVS SEMI TAM TERRA MARIQVE OSTENDIT' ('this mariner's compass shows the way on land as well as at sea') and on the borders 'DER SP?DTER SOL NICHTS VER ACHTEN DEN ER KANS BESSER MACHTEN' ('the critic should despise nothing unless he can make it better'). There is one bun foot (another appears to be missing). The inner part of the upper leaf has a pin gnomon dial for the length of the day marked in red from 8 to 16 and inscribed 'TAGLENG', and for the declination of the sun indicated by means of the symbols of the zodiac signs. 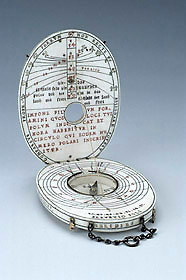 The string gnomon dial is adjustable for latitudes 39?, 42?, 45?, 48?, 51?, 54?, 57?. Below the pin gnomon dial an inscription reads 'die l?chlein sein die polus heh der land und stett das schn?rlein thu in das l?chlein der land und stett' ('the slotlets are the latitudes of the countries and townships: place the string into the slotlet of the latitude of the countries and townships'). On the border is 'COMPASSV PROPE FERRVM NON RECTE ASSIGNARE POTEST' ('the compass cannot point correctly next to iron'). The inner part of the lower leaf has a string gnomon dial for the latitudes mentioned above, marked for common hours from 4 to 12 to 8 and with the date '.1.5. .95.' on the top left. At the bottom the latitude is indicated '.39.42.45.48.51.54.57.' and 'ELEVATIO POLI'. At the centre of the dial is a compass (broken) marked 'S', 'M', 'ORI ENS' and 'OCCI DENS' and with a fleur-de-lis marking north. The outer part of the lower leaf has a pierced lunar volvelle inscribed 'NACHT VHR' and with decoration of moon and stars. The names of the phases are inscribed in Latin on the ivory. At the top is the inscription 'NACH CAMPAST' and the maker's mark (a serpent) and initials (H D), and four bun feet. On the edge of the dial are the names of three cardinal points, 'ORIENS', 'OCCIDENS', 'MERIDIES', and a silver suspension chain.